In previous posts we have outlined instructions on how to use canned responses, create labels and create email filters all in Gmail. We hope you are interested in discovering more features of Gmail and how you can adjust your own account settings. In this post, we are going to introduce you to another feature that you may find a challenge to work with, especially if you have sent and received replies to a number of emails, discussing the same topic. This feature is known as ‘Conversation View’ and it’s function is to group all email replies with the original message allowing you to keep track of the conversation thread. The challenge with this ’email stacking’ is that emails get lost easily and then you have to go searching for a reply amongst a number of replies stacked on top of one another. It can get confusing if a person replies twice to the same email, without you having replied to the first response. On a positive, if you send an email with a different subject line, the email conversation starts fresh. This works well until someone replies and discusses an entirely different topic, the “new topic” email can get lost in amongst the “original subject” email thread. 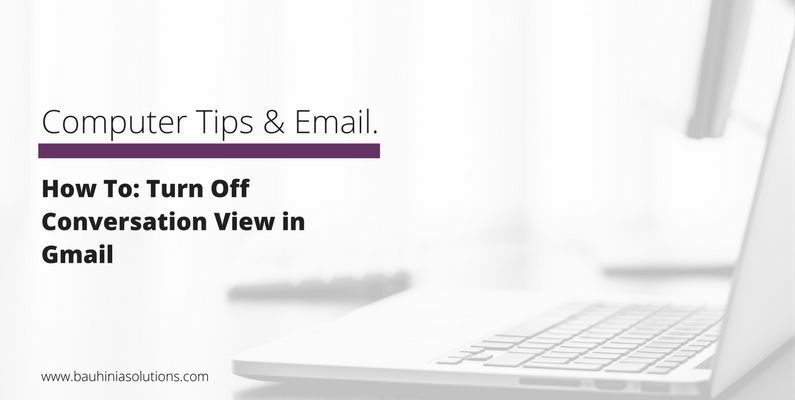 Once you have turned conversation view off, Gmail will separate out every email and you will be able to view your emails in the traditional view. This is a personal choice, there is no right or wrong way to manage your emails. You make the choice that is right for you.